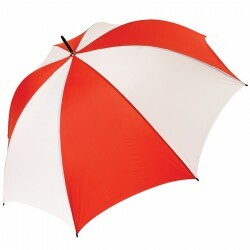 Promotional custom made umbrellas are exclusive and unique promotional items. For businesses who want to maximise the benefits of using personalised umbrellas as their promotional merchandise, you will surely love Promotional Product Experts custom made umbrellas. Without a doubt, your brand will enjoy much attention each time these umbrellas are opened. Give them away on your next corporate event or hand them out as business gifts to customers, clients and even employees. Contact our sales team on ways you can custom make these umbrellas printed with your logo to enjoy the most value for your money. Black electroplated shaft and frame. Overlocked panel joins. Black comfort handle with wrist cord. 190T high quality showerproof nylon fabric.